Centuries of tradition, knowledge, and passion are what you will discover wrapped inside each AVO Heritage cigar created by Master Cigar Composer Avo Uvezian. Since the very beginning, AVO has worked alongside undisputed Master of Tobacco Hendrik Kelner - assisted by Eladio Diaz and Manuel Peralta - to grown the finest tobacco and create the most incredible blends that AVO enthusiasts have enjoyed for years. The AVO Heritage cigar is the result of this incredible collaboration, and celebrates the heritage of the many talented farmers, blenders, and rollers who have contributed their legacy and passion into the making of this cigar. The AVO Heritage blend reflects the cigars from an earlier generation - medium to full in body and strength with deep, spicy undertones, rich complexity, and balanced palate stimulation from beginning to end - the unmistakable signature of these four cigar masters. 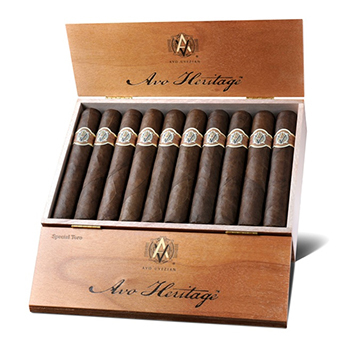 The wrapper of the AVO Heritage is Ecuador Special Sungrown; the binder and filler are Dominican.